West Mauiâs 7 Kapalua Place accentuates the ultimate in super luxurious, elevated island home design & lifestyle mixed with the rarest of beachside locations. Originally built and currently owned by globally renowned maritime artist Christian Riese Lassen, every detail in each aspect of this 7,800 sq ft, private gated property was skillfully crafted and defines the aspiration, imagination personality and vision of its mastermind. Created to capture & maximize the essence of exclusive indoor/outdoor oceanfront living and entertaining. Enjoy five bedrooms, six and a half bathrooms, a grand hall living area highlighted by 25 foot high motorized glass pocket doors that unveil an idyllic outdoor scenic experience. 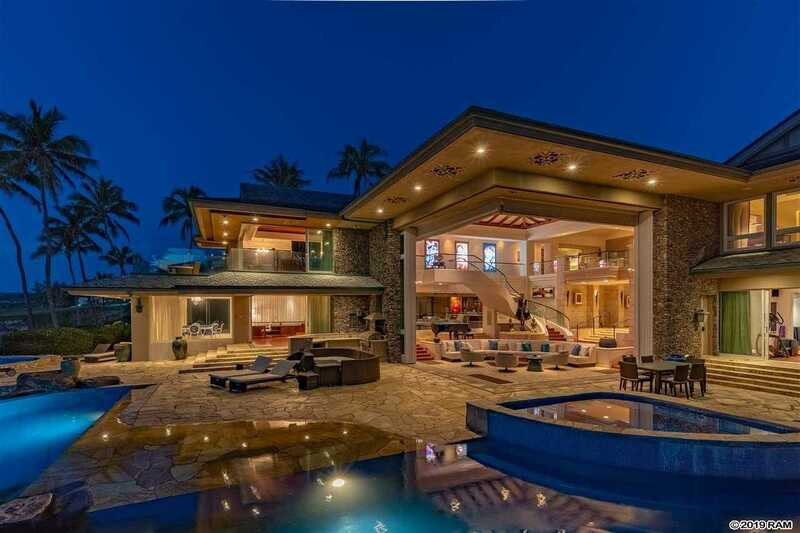 Features an expansive lounge with office, oceanfront dining room & gym, media room, elevator, infinity edge pool and integrated rock waterfall, two oversized hot tubs, outdoor grill station, wet bar, lushly landscaped tropical grounds and a three vehicle garage. Private beachfront access. Furnishings included, excluding selected artwork. Please, send me more information on this property: MLS# 382489 – $13,500,000 – 7 Kapalua Pl, Lahaina, HI 96761.